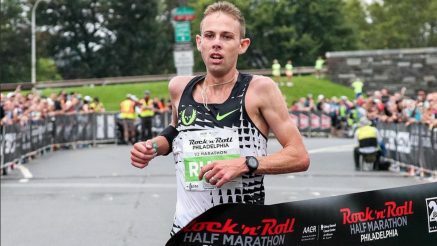 17th September 2017 – After placing second and third at the Boston Marathon earlier in the year, Galen Rupp (USA) and Jordan Hasay (USA) both gave notice that they are in shape to compete at the sharp end of the upcoming Chicago Marathon with strong performances at the Philadelphia half marathon. Galen made a strong move just past the halfway point of the race to put himself clear and he continued to move away over the closing stages of the race to take a comfortable victory in 62:18. Jordan executed her race plan and was very satisfied with the result after that saw her take third place in 70:42. At the Cape Town Marathon there were some solid performances from the PACE athletes. Duncan Maiyo (KEN) achived yet another podium finish placing third in 2:11:26. Just one place behind it was great to see Thomas Ayeko (UGA) back after a frustrating time with injuries, taking fourth in 2:12:03. In the women’s race Doris Changeywo (KEN) was sixth. At the Richmond Running Festival Chris Thompson (GBR) defended his 10k title with a gun to tape victory.